To top, from left: friarielli flowers, yellow and orange marigold flowers, poppy petals, red and purple verbena, dianthus, borage flowers, cornflowers. 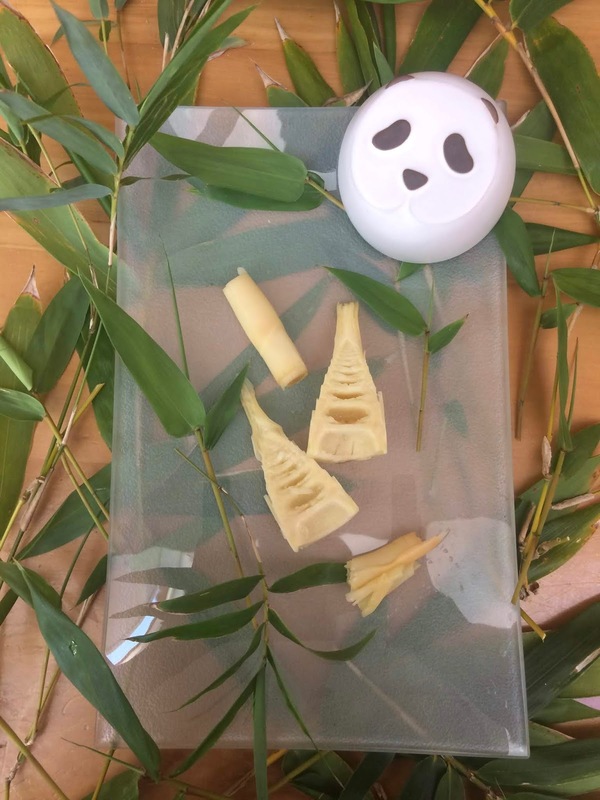 Nothing like freshly foraged bamboo! I live in the Waitakere Ranges and there is quite a bit of bamboo here, mostly considered a weed, but as you know I eat quite a few weeds, and this is no exception. I have some in my driveway too, but I tend to walk down to the neighbour, who has some really big clumps of big bamboo! Or it brings it to me, since he sees when new bamboo shoots up... you have to be quick picking the shoot, once they are out of the ground they grow very quickly! The image below is the maximum length allowed. I started cooking bamboo shoots when I was living in Japan, they were different kind, much 'fatter' but these are good too, better than buying canned bamboo! Peel off the outer green layers, then cut into slices (I also like to cut the tips into two to see the layers), rinse and place in a pot or salted boiling water. Cook for about 15 minutes, then discard the water, rinse, and place in another pot with salted boiling water for few more minutes until soft enough to be cut with a knife (but still a little crunchy. I do this to take away the bitterness. Store in this second brine solution until time to use it. The tips (the best part) can be served as a side dish for a Japanese dinner, the round bits are good in stews and stir fries, but I tend to cut off and discard the nodes, which are harder (I do this after cooking the bamboo shoots). For this stir fry I used bamboo shoots (previously cooked as above), oyster mushrooms, and carrots. Heat a little vegetable oil with a few drops of sesame oil, add a tsp of mince ginger and then the chopped vegetables. Cook for a few minutes, stirring, then add a tbsp of lemon juice and 2 tbsp of Japanese soy sauce, lower the heat, cover and simmer for 6-7 minutes, stirring from time to time. Add chopped coriander at the end (optional). Serve with rice. In the past two month I have been taking lots of photos of my dishes, but posted very few recipes on the blog. Lack of time, yes, but I do cook every day, and not always new things, so it would be silly to repeat recipes. But one thing I can do is to change the appearance of food, especially in Summer, when fruit, vegetables and flowers abound. So here a few tips to make food more colourful! Desserts are the easiest things to colour, naturally. Pictured above some creamy puddings, chocolate with ground pistachio, lemon or vanilla pudding with a drop of berry or cherry syrup and a strawberry, and blueberry pudding made by adding blueberry freeze dried powder to the vanilla puddings. Add edible flowers like dianthus or violets. And here you can find two vegetarian recipes for lemon and raspberry puddings (for blueberry follow the same method but add blueberry powder instead of raspberry powder). Vanilla puddings are even easier, and you can start with a vanilla pudding and then move on and add other ingredients (like chocolate or fruit) and save time. Here is the recipe. Of course you can also layer the different flavours! In summer I do make the most of the edible flowers I grow in the garden, and these can be also used to add a special touch to fruit platters, like this (where I used verbena and dianthus with watermelon, nectarines, peaches, cherries, apricots, blueberries and pomegranate), and even if you cannot make desserts, or have no time, or are on a diet, you will always be able to impress guests with a fruit platter. Here I used rock melon, nectarines, peaches, plums, cherries, pomegranate, calendula and violets. For this one watermelon, nectarines, pink and purply plums, blueberries, cherries, pomegranate and verbena flowers. And even if you don't have the time to cut fruit, presentation is all you need: here some plums presented with some cornflowers (also edible, btw). Also effective to use the watermelon shell as a container for fruit salad, and serve on banana leaves, perhaps with banana flower petals, if you have them). Other leaves work well too, just wash them well first. Just looking at the colours of fruit makes everyone happy, and if you are so pressed for time that you cannot even cut a fruit salad, a basket or two of fruit on the table will always make a good impression. Next tip: make full use of colourful vegetables, radishes, for example, can be grated and used to decorate and flavour food. I had some hinari tofu pockets filled with rice and topped with mushrooms and greens, and a couple of radishes just added interest and colour. The avocado sashimi is already colourful, but adding just one (always edible) flower brought out the green even more. And a few petals (of impatiens) made this vegetarian sushi platter look less 'monocrome' - impatiens are good with savoury food, as they taste a little like rocket salad. Flowers suit the style of Japanese cuisine, but if you don't have edible flowers at hand, or prefer not to use them, just cut a carrot slice like a flower: it will make all the difference. White also helps: mozzarella, feta and other white cheeses bring out the colours in other vegetables. If you are in doubt of what to make, a caprese salad is always a good idea, here a two examples, a classic one and then one with different types of tomatoes, bocconcini, and different herbs (fresh oregano and thyme). More ideas can be found here. Do you remember when all the food coming out of restaurants had a sprinkle of parsley? Well, that may had been OTT at times, but in some ways it does make sense. Fresh herbs are a life saver for brown food, and to give you an example (without parsley) I add chopped coriander to all my Mexican dishes. (fortunately I love it)! In the photo below, clockwise from top left: refried beans, jack fruit, tortillas, vegan chili (sans carne) and guacamole. Then you just need to add a green salads and tomatoes to assemble the tortillas, and you are done! And then, every now and then I do something a bit more colourful (like the chili corn, capsicum and quorn dish below), just for the fun of having added colour, but this is for summer, when corn and capsicums are in season. ... or several flowers! And cherry tomatoes too! Protein, even vegetarian protein, tend to be white/beige/brown, take almonds and other nuts for example (except for the green pistachio nuts), but with a little fruit powder, or berry juice, you can create a colourful display even with a single base ingredient (almond, in this case). Check out the recipe for this easy marzipan here. And of course colourful paper cases help too! 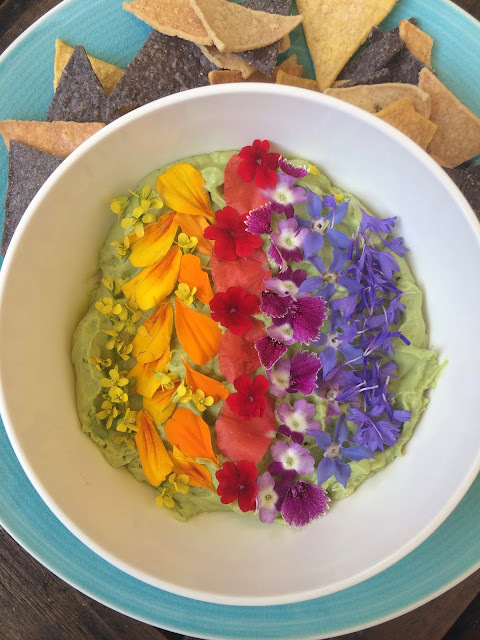 Below I have a brown lentil salad, placed on a bead of mixed green leaves, and decorated with edible flowers, so easy, full of protein, plus it is vegan and gluten free, for the recipe just click here, where you can also find a lot of other recipes using edible flowers. 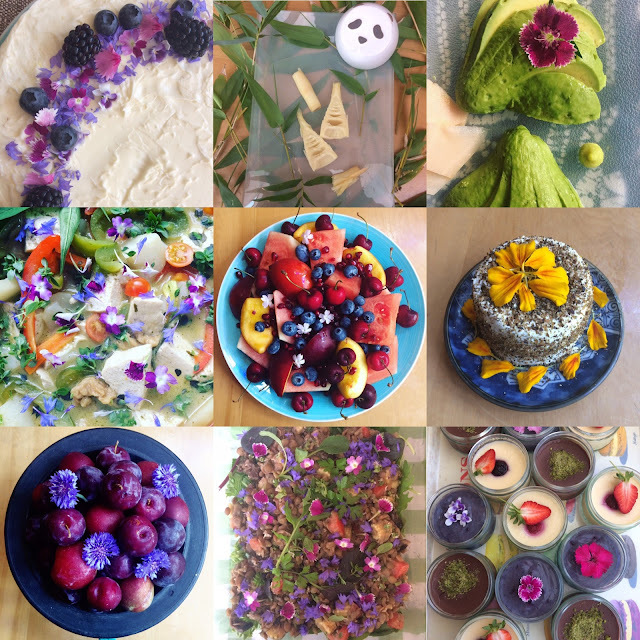 The flower blog is Cooking with Flowers and, although some of the recipes are raw, it mostly deals with actually using flowers in the kitchen and as important ingredients, not just as simple decorations. Click here to view. 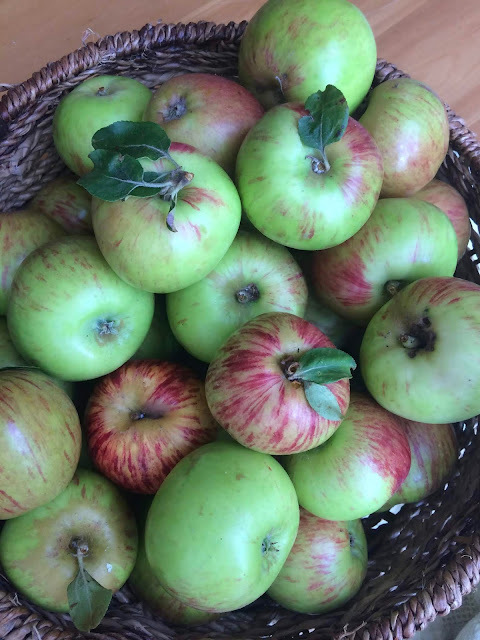 February is the month to celebrate our Slow Food Auckland heirloom apple Oratia Beauty. These beautiful apples are available at the Dragicevich Orchard: 556 West Coast Rd, Oratia. I usually eat them raw or make cakes, but this time I made some cupcakes to take to the Slow Food Picnic at Waitantgi at Waititi. This is my very own cupcake recipe, which I adapt easily and frequently (to add fruit and/or other ingredients) and always works well. The outcome with apple is a bit of a 'muffin', thus the double name in the title of this post. The doses below are for 12, but I doubled them for two tins of cupcakes (so about 8-10 apples, 220g butter, 6 eggs etc.). If your cupcake tin is for smallish cupcakes you may have some leftover mixture even with below doses, so scroll down for more ideas. Line a 12-muffin tray with cupcakes paper cups. In the meantime place the water and lemon juice in a mixing bowl, peel and slice the apples and drop them directly into the lemony water. Melt the butter in a jug, either in the microwave or in the oven (while the oven is warming up for the cupcakes). Place the eggs and sugar in a mixing bowl and whisk, using an electric beater, until the mixture looks light and pale yellow in colour. Slowly add the melted butter and the vanilla essence, if using. Bake for about 18-20 minutes, until golden brown at the top. You can also check by inserting a toothpick into the cupcakes: if it comes out clean the cupcakes are ready. Remove the cupcakes from the tin and let them cool down. 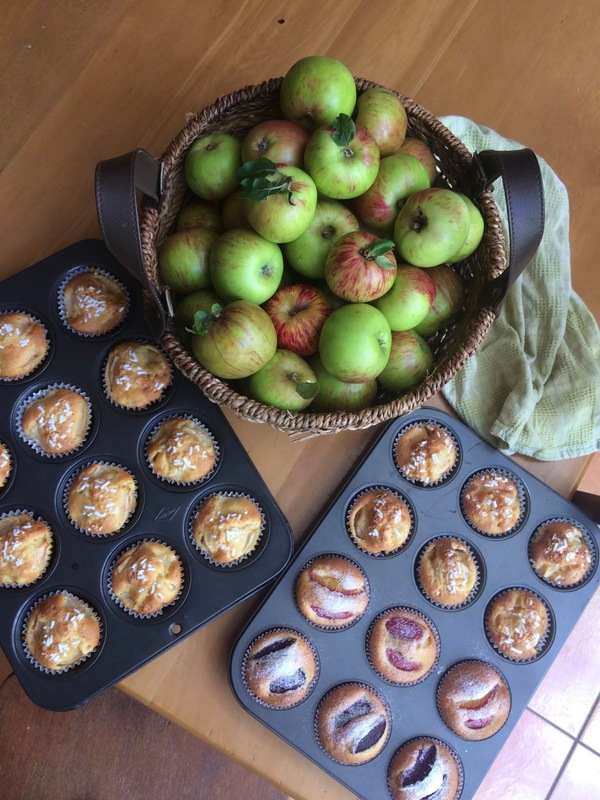 Because I double the doses to make two tins I also made a few plum cupcakes (basic recipe here) with Luisa and Black Doris Plums (also from the Dragicevich Orchard in Oratia) and, with still a little mixture left (when you use slices of fruit they do take space! ), two heart shaped mini cakes (apple, plum and raspberry).